Aubree Fog Quilt Collection - VHC Brands | P.C. 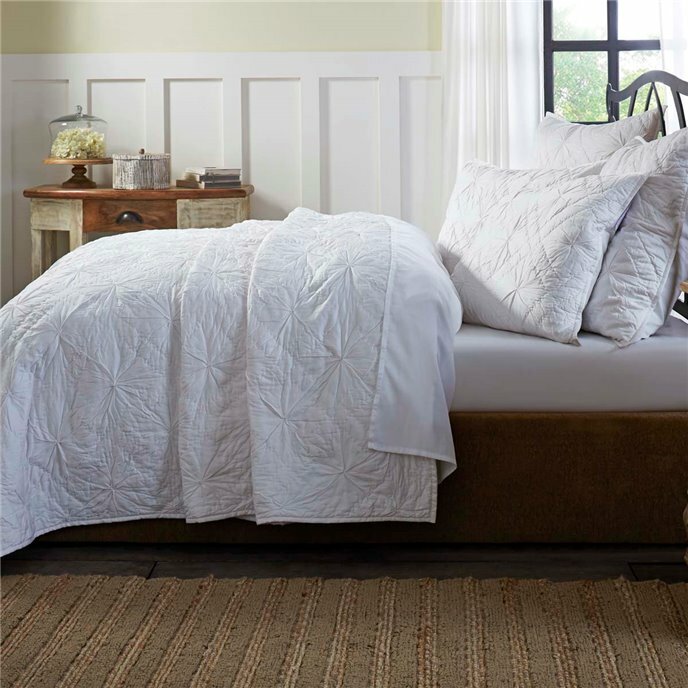 Fallon Co.
Freshen your room with lovely textural bedding in solid white. The Aubree Fog quilt features double railroad hand-quilting on soft fog white sateen fabric to create a diamond pattern. The center of each diamond is gathered for texture and visual interest. The quilt is edged in white binding trim. The back is a solid fog white cotton sateen fabric. 100% cotton shell and batting. Shams and euro shams are offered to complete your room transformation. The quilt is machine wash separately, front load commercial washer, cold water, gentle cycle. Do not tumble dry. Do not dry clean. The shams are machine wash, cold, gentle cycle. Tumble dry. These items are imported. The Aubree Fog queen quilt features double railroad hand-quilting on soft fog white sateen fabric to create a diamond pattern. The center of each diamond is gathered for texture and visual interest. The quilt is edged in white binding trim. The back is a solid fog white cotton sateen fabric. 92"L x 92"W. 100% cotton shell and batting. Machine wash separately, front load commercial washer, cold water, gentle cycle. Do not tumble dry. Do not dry clean. This item is imported. Please note, colors may appear differently in different resolutions and on different computers. Manufacturer's UPC code is 840528157189. The Aubree Fog king quilt features double railroad hand-quilting on soft fog white sateen fabric to create a diamond pattern. The center of each diamond is gathered for texture and visual interest. The quilt is edged in white binding trim. The back is a solid fog white cotton sateen fabric. 92"L x 108"W. 100% cotton shell and batting. Machine wash separately, front load commercial washer, cold water, gentle cycle. Do not tumble dry. Do not dry clean. This item is imported. Please note, colors may appear differently in different resolutions and on different computers. Manufacturer's UPC code is 840528157172. The Aubree Fog standard sham features double railroad hand-quilting on soft fog white sateen fabric to create a diamond pattern. The center of each diamond is gathered for texture and visual interest. The sham is edged in white binding trim. The back is a solid fog white cotton sateen fabric with 3 tie closures and a 3" overlap. Measures 21" x 27". 100% cotton shell and batting. Machine wash cold, gentle cycle. Tumble dry. This item is imported. Please note, colors may appear differently in different resolutions and on different computers. Manufacturer's UPC code is 840528157219. The Aubree Fog King sham features double railroad hand-quilting on soft fog white sateen fabric to create a diamond pattern. The center of each diamond is gathered for texture and visual interest. The sham is edged in white binding trim. The back is a solid fog white cotton sateen fabric with 3 tie closures and a 3" overlap. Measures 21" x 37". 100% cotton shell and batting. Machine wash cold, gentle cycle. Tumble dry. This item is imported. Please note, colors may appear differently in different resolutions and on different computers. Manufacturer's UPC code is 840528157202. The Aubree Fog euro sham features double railroad hand-quilting on soft fog white sateen fabric to create a diamond pattern. The center of each diamond is gathered for texture and visual interest. The sham is edged in white binding trim. The back is a solid fog white cotton sateen fabric with 3 tie closures and a 3" overlap. Measures 26" x 26". 100% cotton shell and batting. Machine wash cold, gentle cycle. Tumble dry. This item is imported. Please note, colors may appear differently in different resolutions and on different computers. Manufacturer's UPC code is 840528157196.